You may already have heard about the ‘new look’ Birthday Celebrations for 2018 which, once again, will be jointly organised by Stratford-upon-Avon Town Council and Stratford-on-Avon District Council. We have been working in partnership with event organiser, LSD Promotions, to create some additional attractions to extend the Celebrations and make it a three-day event. Traditional elements, such as the renowned Parade and Flag Unfurling Ceremony, will still take place on Saturday but this too comes with a memorable twist. In response to the very positive feedback we received following the Shakespeare 400 Parade in 2016, the Councils decided that this convivial and festive approach should focus in all future Celebrations. It is hoped that the new initiative will see as many Stratford-on-Avon based community representatives as possible taking part in the inaugural Community Carnival Parade which will feature walking pageants, inspired by works of literature. 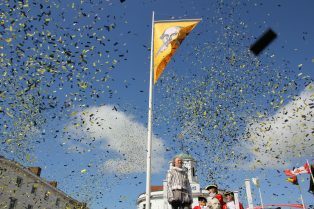 The stage is set in Bridge Street and ‘Mr Shakespeare’ will greet each pageant as they pass and will present them with a quill, symbolizing his literary genius being handed down to all aspiring playwrights and authors thereafter. This Parade promises to be quite a spectacle. There is no limit to the number of participants in each literary pageant, the only stipulation is that each and every tableau should be representative of the work of fiction they set out to portray. The scope is endless as the pageants are not restricted to just works by William Shakespeare. We hope to see characters from the likes of Charles Dickens, Jane Austin, Beatrix Potter, Roald Dahl, A A Milne, Arthur Conan Doyle, and let us not forget J K Rowling – how easy would it be just to come dressed as Harry Potter. The list is endless and almost anything goes. However, needless to say, all pageants must be suitable for a family audience! The Mayor and Chairman of the District Council will judge the pageants and the winner will return to Bridge Street to receive their award and take a final victory lap, all of which will be captured on large screens with a live feed provision. Participants in the traditional Civic Parade will then leave Bridge Street and make their way to Holy Trinity Church to lay flowers on Shakespeare’s grave. Should they wish, those involved in the literary pageants may also join the end of the Civic Parade. However, everyone may well choose to stay in Bancroft Gardens to marvel at the living statues, all rivalling to take first prize in the inaugural ‘National Living Statue Championship’ in celebration of Shakespeare’s Birthday. This is set to become an annual event from 2018 and is exclusive to Stratford-upon-Avon. Apart from the Championship, which will be judged on Sunday, there are a number of other events that are being introduced including a craft market on the Recreation Ground on Saturday and Sunday, Poet’s Corner and a carousel on Waterside, a lightshow from across the river on Saturday evening, together with a plethora of street theatre and live vocalists. We are confident that there will be something for everyone at the Celebrations next year. As you will appreciate there is a lot to organise, and we would be most grateful for your co-operation in advising us early on whether you, and other representatives from the organisation you represent, would like to participate in the Community Carnival Parade next year. Please be kind enough to fill in an Expressions of Interest Form, and return this to us via post or email by 30 October, 2017. In light of new data protection legislation, may I ask you please to specifically tick the box and sign that you give permission for your details to be held on file by Stratford-upon-Avon Town Council for the purposes of participating in future Birthday Celebrations organised by the Town and District Councils. May I also draw your attention to the small administration charge of £10.00 which will help offset the cost of staging the Celebrations and secure your place in the Parade. Detailed information and formal invitations will follow. The Mayor, Victoria Alcock, and District Chairman, George Atkinson, hope they will have the pleasure of welcoming you to the Celebrations.